Trees bleed. When a part of the tree is damaged, a thick liquid slowly oozes out. This liquid aims to quickly clog the hole made, preventing unwanted guests from getting inside. Not too dissimilar to our blood when we bleed. This ‘blood’, known as resin, oozes out to protect the tree if it is damaged. (Sap is different from resin. Sap moves through plants to make sure all parts get the nutrients they need.). This resin, thicker than golden syrup will seep and cover anything in its way. Including animals. Lizards and frogs have been known to become stuck and slowly entombed by this sticky, deadly fluid. But the most common animals to be trapped in a trees resin are insects. Trees are a metropolis for insects: hundreds of insects live under bark, inside cracks, on leaves, and inbetween branches. (I have lead lots of mini-beast hunts, and my favourite part is getting the families to open up some umbrellas and place them upside down beneath a tree. Then they shake the branches. From an whole hidden world on the tree fall dozens of tiny insects and spiders. The look of pure amazement on their faces is incredible: they never imagined that so many animals lived there). Resin is pretty cool stuff. It traps small animals, and then hardens so fast that they are perfectly preserved. What is even cooler, is that the resin itself has been preserved. For millions of years. Hardened, fossilised, resin is known as amber. As perfect as the day they died, animals can be seen trapped inside. On Friday, an enquirer came into the museum with an amber ring. She thought there was an insect inside. I walked over, not expecting much: in museums we get lots of enquiries where people have ‘found a meteorite’ or a piece of amber with a perfect insect. This amber ring did have an insect inside. I was intrigued. It was tricky to see what it was, so I invited her, her 11 year old and 4 year old to my office to peer at the insect under a microscope. I don’t know who was more excited when they peeked down and saw the insect in beautiful detail; me or the 11 year old. A close up of the insect inside the amber. 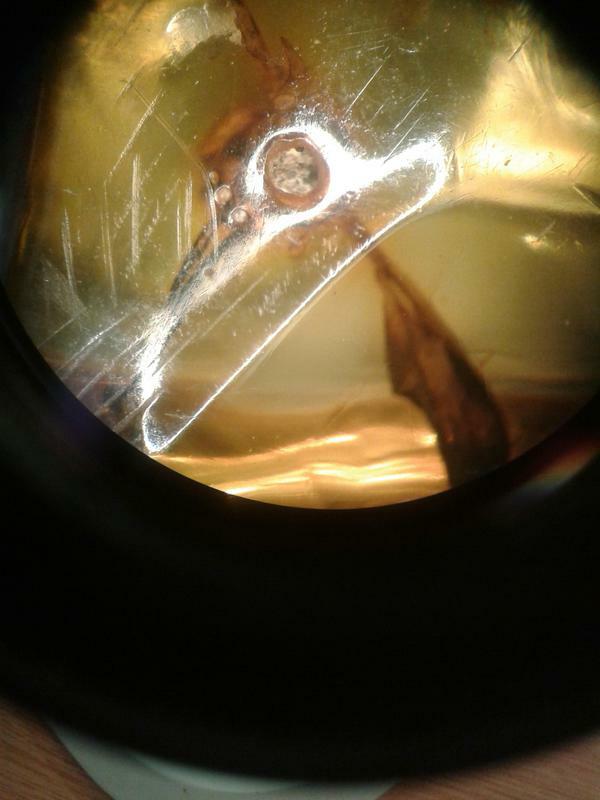 This is the best shot after several attempts of holding my camera phone over the microscope eye piece. Not too bad. As a general natural history curator, I know a little entomology. I know my Coleoptera (beetle) from my Hymenoptera (bees, ants, wasps). Even then within groups, I can identify some of the more familiar ones. Looking at this beautiful insect, it was obvious it was a fly: all flies (Order Diptera) have just one pair of wings, and this persevered beauty had one pair. I was quite pleased with myself. But, there are over 240,000 different species of flies! The mother was happy with the identification of ‘a fly’. The 11 year old was over the moon! But I wanted more. I was lucky to get a reasonable photo from my awful camera phone down the microscope. I posted the images on Twitter, as part of the incredibly popular #FossilFriday. I wasn’t expecting any feedback on the fly, but was secretly hoping there would be some! A good old friend (@FlyGirlNHM) at the Natural History Museum, London, was quite interested, as she is a fly expert (yep, they do exist). She shared the photo, and someone (thank you Morgan Jackson @BioInFocus) managed to identify it as belonging to possibly the SuperFamily Tephritoidea. To narrow it down to belonging to one of just eight Families (out of around 140 different families) is amazing! 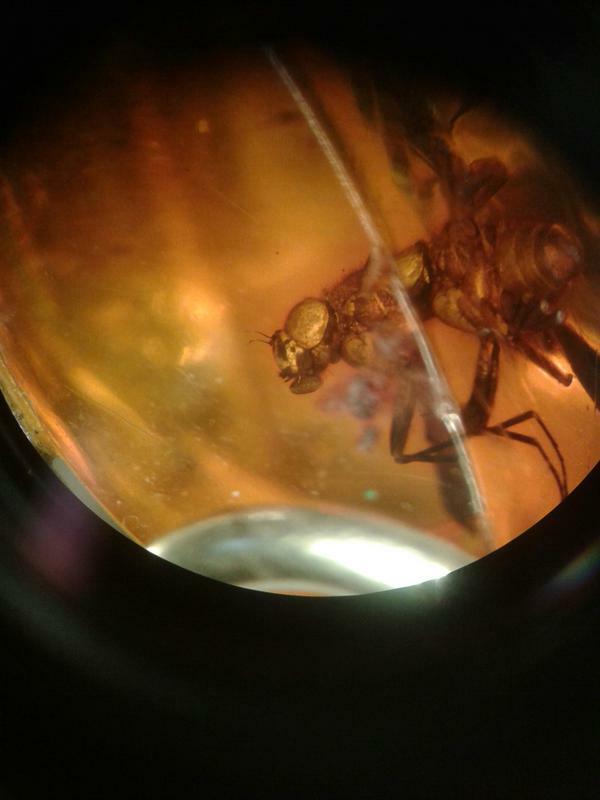 There was no information about where the amber had originally come from, so I dont know how old this little fly is. It was brought from Norwich, but that’s all I know. Most amber found in Britain is though to be Baltic amber. If this piece was, then this little fly is around 40 million years old. There was one last intriguing discovery on the amber. It had been drilled. Right down to the abdomen of the little fly. Perhaps after watching Jurassic Park someone though that this abdomen was full of blood. Although mosquito are a type of fly, the fly in amber lacked the pointy needle mouth. Strange to see such a perfectly drilled hole. Stranger to imagine why the hole was drilled. I am pretty certain that no one has cloned a 40 million year old fly. Pretty certain. This was something very unusual. The piece of amber had been drilled right down to the body of the insect.